Ok, that may be a bit hyperbolic, but it seems unlikely, at least in the foreseeable future. This is a blast from the past. I took a short road trip to Dubuque one night a couple months after I moved here in 2005, just to drive around and see what was there. I knew Dubuque was historic, and had heard it had some nice photo opportunities, and I wasn’t disappointed. I got several nice shots that night, this being one of them. I say that I may never get this shot again because they haven’t turned on the flood lights at night for, I believe, almost ten years. The consistent lighting is what helps make this possible. This was taken about 11:00 pm, if I recall correctly. 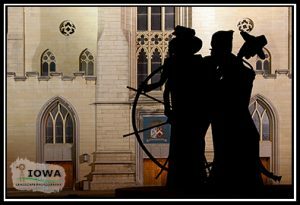 The statue is actually across the street, unlit of course, and that locations helps with the composition, in my opinion. If it were right in front of the building the scene would be too tight and I wouldn’t have been able to get as much of an overall view. I’ve been back to Dubuque many times since, some for photography, some for other reasons. It’s a very nice little city, I think. I’d like another shot at this scene, no pun intended… ok, maybe a little.